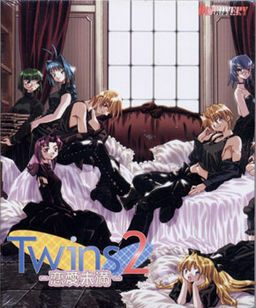 In the previous "Twins," Kureha was able to hook up with Tsubasa Honami. This story takes us 6 months later down the road. Kureha's twin sister, Nao, is depressed because her brother takes all the girls she likes. As she's walking down the street, she sees a cute girl jump out in traffic during a red light. Nao runs over and saves her just in time. Nao looses consciousness, and when she wakes up, she's on the girl's lap. Before she is able to thank the cute girl, an ambulance comes and picks her up. The next day, Nao changes identities with Kureha to sneak into the school. She finds out that her name is Nami Sakanoue, and that she is one of the triplets in love with Kureha. Kureha is a lucky guy, but how will Nao's love end up? What will Kureha do? Not only will you find the girls from the previous "Twins," you'll find 6 new girls appearing in this powered up version! Lets get wild and get it on with many beautiful girls!